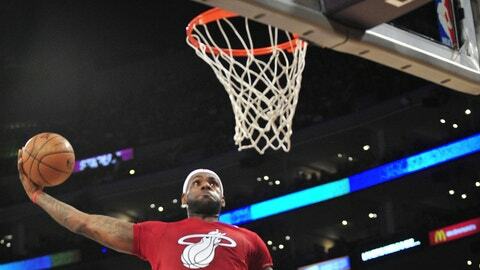 LeBron James became the third basketball named AP Male Athlete of the Year since the award's inception in 1931. "I’m chasing something and it’s bigger than me as a basketball player," James told the AP. "I believe my calling is much higher than being a basketball player. I can inspire people. Youth is huge to me. If I can get kids to look at me as a role model, as a leader, a superhero … those things mean so much, and that’s what I think I was built for. I was put here for this lovely game of basketball, but I don’t think this is the biggest role that I’m going to have." "I don’t think I’ve changed much this year," James said. "I’ve just improved and continued to improve on being more than just as a basketball player. I’ve matured as a leader, as a father, as a husband, as a friend." "You want to be a part of it, but it has to feel real to you," James said. "You don’t want to do something that doesn’t feel much to you, that you’re just doing for the money. We all have money. For me, my time is more than money at this point in my life." "I’m so zoned in on what my task is here this year that it’s hard to think about anything else," James said. "A guy the other day asked me what I’m going to do for New Year’s, and I haven’t even thought about that." "What is there not to like about Miami?" James said. "It is a home. My family is very happy; I’m very comfortable. But U.S. 1? I wish that was a highway."